Jose De Jesus was turning right at a red light, but snow had forced him to drive partially in the straight-ahead lane. A man fights a red-light camera ticket he received during inclement weather. WASHINGTON — The D.C. region experienced a lot of snow this winter, and one driver received a red-light camera ticket as a direct result of the inclement weather. Jose De Jesus received the ticket on Feb. 15 at 14th Street and C Street, in Northwest, at 10:37 p.m. De Jesus works overnights at a federal agency and commutes from Spotsylvania County, Virginia. “There was black ice all over the road and a bunch of snow that was unplowed. To avoid an accident, I moved over a little bit and I saw a flash out of the corner of my eye,” De Jesus says. As the video shows, part of his vehicle was in the right-turn lane, part in a straight lane. The light was red with a green arrow for right turns. D.C. police later concluded that De Jesus accidentally triggered the wrong sensor. However, snow and ice covered much of the right-turn lane. “My vehicle was about 60 percent in the [straight] lane to avoid an accident and slipping on the ice [and] the snow,” says De Jesus. Two weeks after he filed his challenge, the D.C. Department of Motor Vehicles (DMV) ruled against him. writes Hearing Examiner Desiree Mathews. He appealed the decision to the Traffic Adjudication Appeals Board. He also contacted WTOP Ticketbuster after coming across our story about federal employee John Stanton in April 2013. WTOP Ticketbuster put DeJesus in touch with Metropolitan Police Department Program Manager Lisa Sutter. She runs the D.C. police speed, red-light, stop sign and intersection cameras and agreed to re-examine the video on the DeJesus citation. She responded within a few hours of being contacted. Since snow and ice covered part of the right-turn lane, DC Police concluded that De Jesus made the best legal right turn possible under the weather conditions. DMV received the void request on April 1, meaning De Jesus should get a refund of his appeal fee in June, although his circumstances are similar to 400 other drivers who never received their refunds from D.C. DMV. “I’m ecstatic that the ticket got voided once someone actually looked at my evidence. I’m extremely pleased with how Ms. Sutter handled it,” says De Jesus. 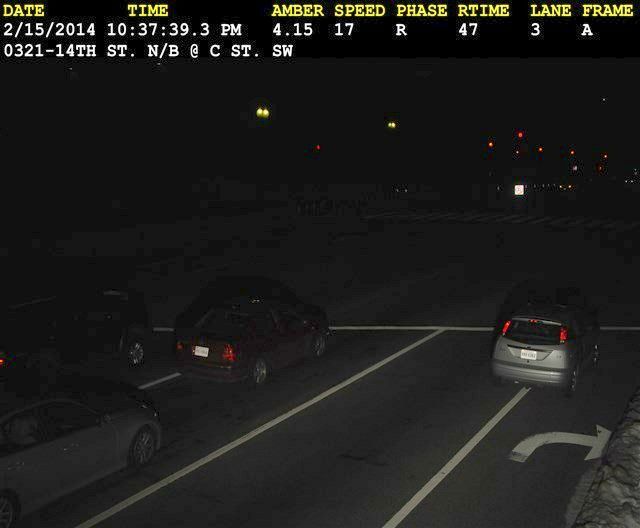 While it’s unclear whether other drivers received bad red-light camera tickets, the lesson from this story is that the snow can cause false positives. “All I can say is just keep it up. I’m so happy that you’re there and that you’re an advocate for people who are in the right,” says De Jesus. If you think you’re the victim of a bogus speed camera, red-light camera or parking ticket in D.C., Maryland or Virginia, WTOP may be able to help you cut the red tape. Email us your case – along with documentation – to ticketbuster@wtop.com.